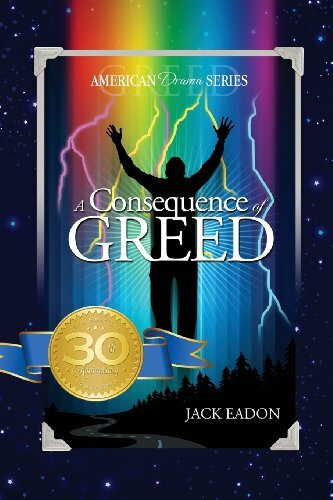 Article first published as Interview: Jack Eadon, Author of ‘A Consequence of Greed’ on Blogcritics. After a variety of successful careers and a challenging medical history, Jack Eadon writes and does his art to capture life’s beauty and a person’s struggle through it to prevail. Susan: Hi Jack, Thank you for visiting with me. As a fan of your work, I am really excited to catch up and find out what you have been up since we last met. At that time, you were working on the first two books in your seven-book American Drama Series about your alter ego, Marcus Ramsey. Where are you in the series? Are you working on book three? Do you plan to continue to follow Marcus’ life up to the seventh book? Jack: Hi Susan, nice to talk to you again! A lot has been going on. I’ve finished book one, Head Trip and book two, A Consequence of Greed, which takes Marcus Ramsay into his thirties. Now, he has relocated to Southern California and has changed careers totally to an advertising photographer. Book three, Latent Image is about his time in California, where he gets embroiled in a romance/who-dun-it that actually has a character who temporarily can’t talk! Imagine writing dialogue for someone who doesn’t talk! The character was inspired by my late distant cousin in the UK, who lost his voice box and tongue to throat cancer. Phil fought valiantly and gave me the perspective I needed to make my character real. Latent Image was originally conceived after I had read Fitzgerald’s, The Great Gatsby, for the sixth time, my favorite novel. F. Scott is a mentor of mine, so the plot in Latent Image is rich with visual descriptors but thin on prose, like Hemingway, and very intricately structured. It’ll be one of those books you’ll have to read twice, or maybe six times, just to enjoy all the “reveal pellets” I’ve dropped for you along the way. The ending will be a real surprise! No fair reading ahead! Susan: Jack, I must confess that I am not only a fan of your writing I am truly an admirer of your strength, resilience, and zest for life. In 2010, you had your fifth and final brain surgery. Where does your health stand currently? Jack: My surgery in 2010 was so “successful” that a world-famous neurosurgeon finally removed my benign, but recurrent brain tumor. That’s good news andbad news. It’s good news because the tumor is supposedly gone, but it’s bad news because there was so much trauma to my brain stem that my swallowing, balance, and facial nerves were severely traumatized, making it impossible for me to have an MRI to confirm the tumor’s actually gone! So, in the meantime, I don’t know if that little twinge I feel is a result of my protracted recovery OR the tumor coming back again. As Dickens wrote, “It was the best of times; it was the worst of times.” So, I live every day as if it were my last. I’ve even renewed my childhood interest in art and have several galleries of work on Fine Art America—available in five countries—on a variety of items from prints to throw pillows to smartphone cases! There are some unique gift ideas for not a lot of money! You can easily reach Fine Art America reachable from my new site, www.jackeadon.com. Susan: Through the years, I have followed your amazing creativity express itself through music, photography, writing, and now art. Such is your legacy – a renaissance man? Yet, you somehow always manage to come up with something new. What will you do next, save the Earth? My campaign’s slogan is “Don’t Drain • Sustain.” That simply means conserve our precious resources, while doing everything possible to replace and restore what we take away from our planet. Go to www.sav.earth and see how Don’t Drain – Sustain is what you can do. Spread the word. Change human consciousness – that is what you can do. Make a “SAVE EARTH!” message daily, set your smartphone to ring a daily alarm, make noise, and be obnoxious. After all, we’re talking about saving the planet! Susan: The fact that you are able to think about everything most of us take for granted, such as our own planet, while having to fight so hard to be able to stay with us, and live a high quality of life, speaks tons about your spiritual strength. To be able to produce such wonderful and enjoyable creative works on top of everything else makes you a guru in my eyes, and I’m sure many other people would agree with me. What message or life lesson would you like to share as a part of your legacy to the upcoming generations? Jack: I’ve been accused of being a guru of sorts. Maybe it’s because I live like a hermit in either my desert place, which I call Casa Paz like in Edward Abbey’s, Desert Solitaire, or my mountain cabin, which I call Shangri-La, my Walden’s Pond. Both have helped me see, particularly since the last surgery, how humans live a life cluttered with noise, a running conversation in their heads. We don’t often stop and listen for the stillness that exists between the bits of noise. That is the peace we are seeking. I really believe we are all One. So, no matter what our circumstance, we are together. By really understanding that, we can enrich our lives and relationships. Susan: Jack, how can anyone help you to save the Earth? And where can we find out more about all that you are doing? Jack: On the website www.sav.earth, there are a number of links and videos that show how folks can avoid draining and start sustaining our planet. Recycling and resource conservation tips are also demonstrated. We even have an Action Pack people can order, which allows them to spread the word seamlessly, at the gym, in the car, and while shopping. In fact, chains, like Ralphs out in LA, have been offered the Save Earth! reusable shopping bag. It’s a stylish way to broadcast support of Save Earth! The more people broadcast their support, the more likely we are to change the consciousness of the planet. That’s why we suggest throwing a Save Earth! party like a Tupperware party, to spread the word. We already had 30 come to our event, and each guest left with a Save Earth!favor and party planner for their own party! I figure each individual will touch 1,000,000 others over the next five years. If everyone who reads this supported the cause, that would be 1,000,0000 people for each one. That’s probably half the population of the United States in five years! Not bad. Susan: I find your art inspiring and relevant to your Save Earth! mission. One of my favorite pieces of art that you have showed me is the “Hope is a Choice” photo. Where can people find your art? Jack: By going to my new web site, www.jackeadon.com people can access all my galleries and even get my signed art on smartphone cases, pillows, and prints at Fine Art America. It’s exciting to have some guy in Finland look at my work and buy a print or pillow or a smartphone case! They even have a case for the iPhone 7 models! Susan: I have been dying to ask you. How are you able to find motivation to do so much, and do it so well, in spite of all of the long time health challenges you have had to face in your life? Jack: The credo I live by every day is “Live in Color.” It’s a little like thinking like Don Quixote. Tomorrow, how big a day can I make it? If I keep that perspective then every day will be a little over the top and I’ll die a happy man. Susan: What advice can you offer to some of us enduring long chronic conditions or even fatal illnesses about self-motivation to keep living? Jack: Live in the Now. Focus on feelings of empathy, all the mushy stuff. “Live in Color” no matter what your circumstances are. Susan: Jack, it has been a pleasure and inspiring to say the least speaking with you. Any final words of wisdom for our audience? Jack: Sure. Don’t complain about life. The first few words of, “A Road Less Traveled” are, “Life is difficult.” One of my favorite sayings is, “Life is in the trying.” We ought to remember both. This entry was posted in Arts & Entertainments, Author Interviews, Books, Fiction, Literary Fiction, Photography and tagged A Consequence of Greed, Author Interviews, Jack Eadon, SaveEarth!. Bookmark the permalink.